The runway fashion – Good to see, hard to wear! Fashion shows and film festivals portray the best of styles and followers can understand the changing trends in the fashion biz. But, how practical do we as consumers find these fashion looks? When I think of the runway fashion, I am always reminded of gothic make up, crazy head gears, insufferable heals and clothes that no one can really wear off-ramp. 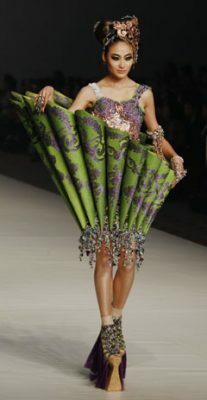 This makes runway looks inappropriate or impractical solutions to our wardrobe problems. This is exactly the kind of fashion trend I am referring to. Come, on!! We cannot replicate this style at any party or occasion. If we do, the reactions would probably be something that you will remember for a lifetime. A consumer’s major issue is to the bridge the gap between what we see on the runway to what we see at the store. While the red carpet is the best place for a designer to showcase his/her creativity, once in a while, the attention needs to go to the masses as well. In an ideal world if fashion could be more realistic and affordable, it would work for the benefit of all.